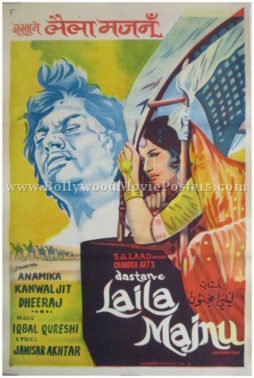 Old Bollywood poster for sale of the Hindi film Dastan-E-Laila Majnu (1974). This is an actual surviving old Bollywood poster for sale of the 1974 Hindi film that starred Anamika, Kanwaljit Singh and Dheeraj Kumar in lead roles. Printed and circulated a few years after the original first release of the film (somewhere in the 1970s), this old Bollywood movie poster for sale was printed for publicity of the film but never ended up being used. Dastan-E-Laila Majnu was based on the legendary tale of two lovers Laila and Majnu (India’s Romeo and Juliet). This old Bollywood poster was originally designed in hand painted oil on canvas format by a small time art studio in Kolkata. Brilliant hand drawn portraits of Laila and Majnu (Anamika and Kanwaljit Singh respectively) are seen in this old Bollywood poster. The poster is set against a yellow green background with the lettering at the bottom appearing in a stunning font.